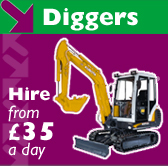 Whether you are searching for top quality garden machinery hire in Newquay, or Mini digger hire in Padstow, then we are the business who can provide all the solutions to your needs and requirements. We deliver to most areas of Mid Cornwall and are renowned for our reasonably priced quick efficient service. Hutton Hire and Supplies offer a comprehensive service to both trade and domestic customers, with account facilities available to regular trade customers, we offer a quick low cost delivery service throughout the Mid Cornwall are and will always deliver to a wider area if possible. 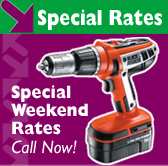 If you should require long term hires or are considering purchasing instead then let us quote you our best rates. Our workshop is at your disposal for servicing and repair work all at reasonable cost. All prices listed on this website are + vat where applicable.